ASO also referred to as App Search Optimization is the process of optimizing your mobile game or app to help boost it’s visibility and rank in the App Store search results. Although there’s no longer a silver bullet to app discoverability, ASO is an important part of marketing your indie game. It can improve your app’s chances for better visibility which can ultimately lead to more downloads. In this article, we’re going to cover the basics of ASO and share some of our best strategies to help you research and find relevant keywords. Using these simple ASO methods and tools will make it easy to optimize your App Store listing and move up in rank. Your game’s title, associated keywords, description, app icon, screenshots, and reviews all play a role in your app’s overall visibility. It’s important to optimize each of these key factors to get the best results. At its core, ASO is similar to SEO (Search Engine Optimization). The goal is to use keywords and high-quality content to improve your ranking. Instead of Google’s search engine, your target is the App Store’s. The title of your app and your keywords are essential for ASO. It’s how you’re going to be found. So, make sure to include your primary keyword in your app title, if it’s your app name that’s even better. Apple has a 50 character limit for app names, and users can see only the first 25 characters without clicking on the app. Google Play has a 30 character restriction. Keep all of this in mind when you’re coming up with your title. Quality is vital when you’re trying to optimize your app, so avoid stuffing keywords. When it comes to app descriptions, Apple and Google Play are very different. Depending on which platform you’re submitting your game to, there are several key points that you need to remember to optimize your app listing. If you’re publishing an app or game on iOS, you don’t have to write a lengthy description or include a bunch of ASO keywords. However, it’s paramount that you nail the first three lines in your App Store description. Users can only see those first few lines. If they want to read the rest, they have to click more. You have to really convey what your game is about and entice them to download or click to find out more. Always try to write a good description and list some of the main features of your app. Google Play ASO functions similar to SEO. Writing a quality description, including keywords throughout and listing features ALL matter. In Google Play there is a short description and a long description. Always try to work your main keyword into your short description for optimization. With your long description quality and keyword density is key. Try to write an excellent app description and include your target keywords a minimum of 5 times within the text. Avoid stuffing keywords. Make sure they flow naturally with the text the same way you would when writing SEO content. For ASO, you need app icons and screenshots that are polished and attention grabbing. They are both major selling points for your game and the first thing that people notice about your game. Never submit an app with low quality screenshots or a lack-luster icon. For App Search Optimization make sure all of your images are high-quality. Don’t cut corners here. Use high-resolution images and the correct size for each platform that you plan on publishing your app. Remember, you want to use colors and images that not only represent your game but are striking as well. Just look at the icons of some of the top games in the charts, and you’ll get a clear idea of which styles and combinations work the best. Although there’s only one screenshot required to submit your app, always take advantage of the other available slots. Aim to have at least four if not all five screenshots of your game included in your App Store listing. To further optimize place your very best screenshot first to help captivate users. Try to show off the best features of your app. You can also add captions to help emphasize your unique gameplay and to point out specific features. Another determining factor in your listing’s ASO is your app reviews. It’s important to have a good amount of positive reviews, to help boost your game’s ranking. To get more reviews you can ask your friends or family members. Integrate an app review plugin that will pop up and ask players to review the app at a certain point in the game or after a set amount of uses. So, how do you find low competitive keywords? Which keyword research tools should I use? Well, the secret to finding low competitive keywords is to follow the basic formula for achieving organic downloads, which is (relevance) + (competition) + (traffic quantity). 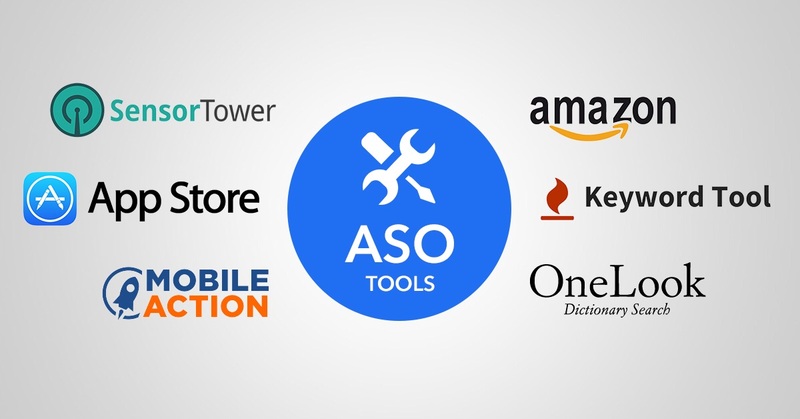 Use multiple ASO tools to analyze and find the best low competitive keywords for your app. Then work them into your title (if applicable), keyword field and description for total optimization. It can be daunting at first, but I’ll walk you through the whole process. You can use all of these tools or just one or two, that you feel works best for you. When you’re conducting keyword research using multiple techniques and tools can help you with the brainstorming process as well as narrowing down your list. To get started, open a notepad or text editor program for taking notes and creating your potential keyword list. Think about your app or game and start typing all of the keywords you think you should include. Don’t think too hard about it. Just write whatever comes to you. A great tool for finding keywords is the dictionary site called OneLook.com. To use this tool for ASO go to www.onelook.com and scroll down to the bottom of the page to where it says ‘advanced help’ and click on the ‘reverse dictionary’ or use the following direct link – http://www.onelook.com/reverse-dictionary.shtml I highly recommend bookmarking it. In the ‘Describe concept here’ search box enter the primary key for your game. Ex: I’m researching keys for a new racing game. So I’m going to type the key ‘racing.’ A numbered list of related terms for racing quickly appears. What’s impressive about this tool is that the list is automatically sorted by relevance. Within this list, there are over 100 related words that can be further researched. One of the first terms is racetrack which might be a good search term. Racers, Rallycross, Karting, Grand Prix , are also unique keywords, many of them are words that you wouldn’t have thought of right off-the-bat. OneLook is a phenomenal tool to use to help you generate not only great keywords but unique game names as well. Dragsters, for example, is another unique key that could also be a cool game name. There’s also advanced filter settings that you can use to refine the search results if you’re looking for more specific terms as well. Now that we have a list of related words and phrases to work with try to look it over and start adding any words that you think would work well for your game. Copy and paste some of the keywords that you feel have potential, but don’t overthink it too much. Try to focus on selecting terms that are relevant to your game’s concept. Choose the words that you think will work well for your game. We’ll do further research and examine the data on each term later. There’s also no length limit when you’re creating your potential keyword list, so try to add all the words you believe might work. Quick Tip: Don’t forget to periodically save your NotePad or Text Edit file as you go! Now let’s research some ASO keywords using the App Store Search Technique. To do this, just grab your iOS device and tap on the App Store icon and then tap the ‘search’ option located at the bottom of the screen. You’ll automatically see a list of Trending Searches. Now tap on the search bar at the top of the screen and enter one of your game’s main search terms or a name that you’re using for your keyword research. You even take this technique a step further with the use of the ASO research tool called Keywordtool.io. This search tool is great to use for research. Its App Store search option allows users to go beyond the top dozen or so searches that appear on an Apple device and view a longer, more extensive list. Knowing what’s out there and what people are searching for is quintessential when you’re trying to optimize. There’s also Google, YouTube, and Bing search features available for subscription members. However, using the App Store Search tab is free. After you’ve recorded a couple of potential terms from the search performed on your device, go to keywordtool.io website. Click on the App Store Search tab and enter the same search term you researched earlier on your phone and then hit enter. A massive list of game names and phrases that people have searched for in the App Store will appear. Scroll down and pay attention to the keyword suggestions marked in bold. You’ll notice that the same ones from your device are listed along with hundreds of other terms in no particular order. This list is not prioritized like Apple’s with only the top and most recent searches. These suggestions include virtually every possible search related to the key you’ve entered. Keywordtool.io makes it easy to find unique keywords quickly. Continue to scroll down the suggestions and add any terms to your list that you feel are noteworthy. Using both the Apple’s App Store Search and Keywordtool.io will give you a broader range of keywords to use. Amazon, the popular shopping site, can also help you find unique low competitive keywords. Simply go to Amazon and click on ‘Shop by Department’ and scroll down and click on the ‘Toys & Games’ category. Search in the toys category not the video games section. In the search box try to enter a related term. As you scroll down look for any words that catch your attention that you haven’t already added to your list. Hunt for keywords hidden within the toy names but try to stay away from the notable brand trademarks. You can also do this method by going to the left side of the screen under ‘Toys & Games’ and finding a relevant category related to your game’s theme. For example, if you’re creating a sports themed game than you might want to browse through the sports & outdoor play category or if your game has a cutesy animal theme then maybe the stuffed animals or puppets category might work well for you. Remember, this technique is just to find those few possible gems that you might have missed, so try not to spend too much time searching for keys here. The goal of all of these techniques is to build your game’s name and or keyword list off of data instead of pure whim. Although we’ve created this long list of possible keys only half of them will ultimately make it to our keyword spreadsheet, and only a small portion of those will be used. Despite the lengthy process, the result will produce not only some killer low competitive keywords but a file of researched keywords that you can refer to later down the line when you update your app or need some keywords for a new but similar themed game. By now you should have a long list of potential terms. Open up Excel or Google Spreadsheet and create a keyword research spreadsheet. Name the first column ‘Keyword list.’ Then select keyword analysis tool or tools that you want to use. Sensor Tower is what we’re using in this walk-through, but you can use any analytic platform you prefer. It’s good to use an alternate version to compare data like Mobile Action, but if your budget is limited, you can use just one. App Annie, Search Man, AppCicada, and AppTweak are also options. To format your spreadsheet, designate a column for each of the platforms’ data statistics. For example, with Sensor Tower, you’ll need to add columns for traffic, iPhone difficulty, and competition. Now let’s research each keyword and refine our list. Go to Sensor Tower’s ‘keyword research’ section. Enter the first word on your list into the search bar and hit enter. On the right side of the screen, you’ll see the statistics on traffic and difficulty for that particular word. As pictured below, traffic for drift is 5.3, and the iPhone difficulty level is 3.9 which is low, making the odds of ranking for this keyword relatively easy. Any keyword with traffic over 1.0 and iPhone difficulty under 4.2 on average is considered to be a low competitive keyword depending on the level of app competition or the number of iPhone Apps listed. The competition is the deciding factor on whether or not it’s a keyword you’ll want to use. For example, Drift is considerably high on the traffic scale and low in rank difficulty. The competition for it moderately low, making it a great keyword to use. So, that word is worth keeping on the list. Let’s also take a quick look at the keyword spy feature in Sensor Tower. When you research a term, the top apps that rank for that particular keyword will appear. Clicking on the ‘keyword spy’ icon will reveal a list of all of the app’s keywords. You can click to track any of the keywords listed. It’s a great ASO tool to use to see what keywords some of the top ranking games are using. To speed of the process of researching keywords on your list, you can utilize Sensor Tower’s keyword tracking feature. Simply go to the ‘Keyword Rankings’ section under App Store Optimization. At the bottom is an ‘All Keywords’ section that allows users to add search terms that they want to track. Sensor Tower will automatically pull up all of the data for each keyword you enter. Click on the green ‘Add New Keyword’ button and a box will appear. Start to copy and paste the words from your ‘potential keyword list.’ It is considered a bulk upload so remember to separate keywords with commas. Add as many of your keywords, if not all of them into Sensor Tower’s tracking feature, then click on the small arrow below the iPhone difficulty heading. The results will filter with the lowest iPhone difficulty level appearing first. Go down the list deleting any keywords with high overall competition or any terms you feel would not be a good fit for your game, now that you’re looking at it again, along with its data. Then scroll down to the bottom of the page and click the ‘download reports’ followed by the ‘daily report for all countries’ option. Sensor Tower will generate an Excel spreadsheet with the data for each keyword. You can use this generated spreadsheet to edit the data to your preference before copying and pasting it the keyword spreadsheet. It’s best to break down the data into an easy to read layout first. To do this start by eliminating any unnecessary information. All you really need is the Keywords/Terms, Traffic, iPhone Difficulty, and Competition columns. The App ID, App Name, and Country columns can be deleted. The Device column can also be removed, but it’s important to edit it prior. Sensor Tower generates both iPhone and iPad statistics. Open up your keyword spreadsheet. Then copy and paste the data from Sensor Tower’s spreadsheet. Now that all of the hard work is over, all you need to do is select the keywords that want to use for your game. There’s no right or wrong way to analyze your spreadsheet at this point, but you can make it easy to dissect by color coding the keywords that are your top choices. Pick the best terms to use and narrow down your list. Then choose your final set of keywords. Quick Tip: If you see a term that you might want to use later on or include in the game’s description, highlight it a particular color in your spreadsheet as a reminder. Remember, it’s the small details, like your app’s icon image, the name, gameplay screenshots, and those little-hidden keywords that can help determine how well your game will rank in the charts. Taking the time and effort to research your keywords, can lead to success. Use these ASO techniques to find those “little details” that will make big things happen for your game! Its a shame that at one point Buildbox Owner says ASO is dead and enroll people with the WHOPPING $6000 on Publisher Elite Program with an unknown outcome. And on the other hand they write an article about ASO which clearly says “According to Apple, 65% of all app downloads come from search queries within the App Store”. Thats a double standard to maintain. There is no double standard. ASO is one of the many bases that you need to cover when you’re releasing your game solo. In the early days of the App Store, it used to be the only step you had take to achieve success, but that has changed. Now there are over 2 million apps in the App Store, making it more difficult, which is what the previous article was suggesting. Apple stated recently that 65% of ALL app downloads was found with search queries. ‘All’ includes big brands and popular trending apps. For indies you still need to do a little more to get noticed. This is why we cover all the different strategies in our game business blog, including ASO. If you have any questions or concerns regarding Publisher Elite please contact our support team at support@buildbox.com. btw, does BuildBox have such App Review plugin like the one suggested? Thanks John :) Glad you found it helpful!